With Thanksgiving over and the Holidays right around the corner, it’s time to find the perfect tree! So you get the kids packed up in the car, head to the tree lot, and realize you have no idea what you’re looking for. How tall is your ceiling? What is the difference between a spruce and a balsam tree? Will this tree even fit through your door? 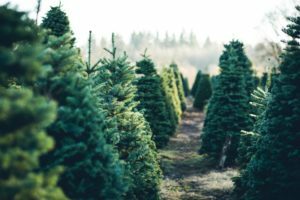 These are all valid questions, and before you start to feel overwhelmed with something other than Christmas spirit, review these easy steps below to find that perfect tree, and how to make sure it lasts all season long! When you get to your local tree farm you see a long list of tree names you don’t even recognize which can be confusing! Each tree species is a little different and to be able to find the right tree for your family you need to find one that will work best in your household. For example, if you have children, you’ll want to steer more towards trees with softer needle like pines or firs. However, if you’re trying to keep your furry friends away from your tree and your precious ornaments, you can go for a spruce tree that has sharper needles. Once you find one that you like the look of, take a look at the trunk and see if it has a slight stickiness to it. That way you know that it is still producing sap and will last much longer. And take a look at the needles on the tree. Bend them in half with your fingers; fresh firs should snap, while fresh pines bend and should not break. There’s nothing worse than picking out the best Christmas tree on the lot, getting it home, and finding out it’s too tall for your room. Before you leave home, measure both your ceiling height and the height of your Christmas tree stand to ensure the perfect fit. After you’ve gotten your tree home and ready to set it up in the tree stand, grab your saw and cut a small layer of the truck one more time to make sure you have a fresh layer of wood to soak up water. Sap is used to seal trees that have been nicked so once you cut the tree down, the sap starts to seal everything up! As tempting as it is to have your tree set up next to your fireplace, you may want to steer clear of that. Try and keep your tree cool and watered every day to prevent it from drying out. Once you’ve gotten your tree up, now comes the fun part where you can start decorating it with your family’s Christmas traditions. Family and tradition is extremely important to Keleny Top Soil. We want to always provide you with the best soil and service out there. For any of your landscaping needs, trust the family that knows good dirt, Keleny.